Years ago, FAR SIDE cartoonist/genius Gary Larson drew a cartoon in which a man was talking to his dog Ginger about her habit of rifling through the garbage. The cartoon was captioned, "What We Say To Dogs" and "What they hear." The man went on about how Ginger had better not get into the garbage again, or else, but all the dog heard was, "Blah blah blah GINGER, blah blah blah GINGER." (You'll find the cartoon here.) But you can already guess my point: this is pretty much how six-year-olds hear their parents. To all whom I'm about to offend -- especially parents who have graciously invited my kids to your kid's birthday party -- I apologize. But I cannot help myself. 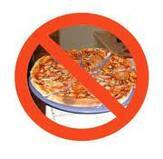 Life really is too short for Birthday Party Pizza. By Birthday Party Pizza, I mean the super cheap kind that comes from a national fast-food chain and is meant to inexpensively feed a horde of small children who'd rather get right to the main event -- birthday cake -- and is also meant to feed parents who attend the parties too and find themselves in need of a little more sustenance than the precut carrots, celery sticks and ranch dressing. In this day and age of slow food, locally grown ingredients, organic this and free-range that, there is some awesome pizza to be had out there. The other day, I ran into a pregnant mother of two at the mall, trailing the kindergartner who's in my daughter's class, and her preschooler. 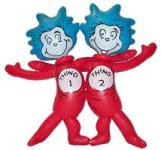 I mentioned Thing 2 and I were looking forward to the playdate we'd scheduled with her kindergartner the upcoming Saturday, and she got a puzzled look on her face. "Wait, is that the 7th?" she asked. I nodded. "That's her birthday," she exclaimed, pointing to her preschooler. The mom had actually suggested the date to me about three or four weeks back in an email, when she wrote about making a playdate. Now it was suddenly occurring to her that she'd double-booked, and not just on any day, but her other daughter's birthday. She turned a bit reddish and then said something to the affect of, "You must think I'm a total space cadet. But see, I have three calendars. I know I shouldn't but ..." And on she went until I interrupted with this: "It's fine, I get it. I have Mom Brain too. You not only have Mom Brain, you have Pregnant Mom Brain." She knew what I was talking about: moms have too friggin' much to remember. And it's to the point where, yes, you could actually FORGET the date of your own kid's birthday in a moment of well-intentioned, over-scheduling madness.